Now a whole new generation of children will be exposed to Mister Rogers — and the joys of changing into a sweater and sneakers immediately after coming home. 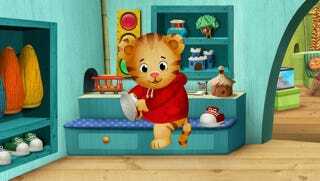 PBS is creating a new animated show called Daniel Tiger's Neighborhood, scheduled to debut in fall 2012. The show takes place in the "Neighborhood of Make Believe" and features the four-year-old son of Daniel Striped Tiger, as well as other pre-school aged children of the original inhabitants. "In research, the trolley has become a very big character with the kids we've tested this with," Morrison said. "They're 3 and 4 and have no clue what a trolley is but they like it and it plays a role in the Neighborhood."